A women's heart is where her handbag is. Style, class, and a side of sass makes for the perfect accessories. So, what if you are a vampire? Other than beautiful sharp pointy teeth, what are other accessory options? Well, our un-dead friends carry around their fragile hearts in the place they rest. So, it only makes sense that a coffin purse is the perfect place to carry around hidden treasures. Treasures like, credit cards, cell phones, and all that beautiful black lipstick. For the perfect vampire, goth, accessory just carry around the Coffin Handbag Purse. 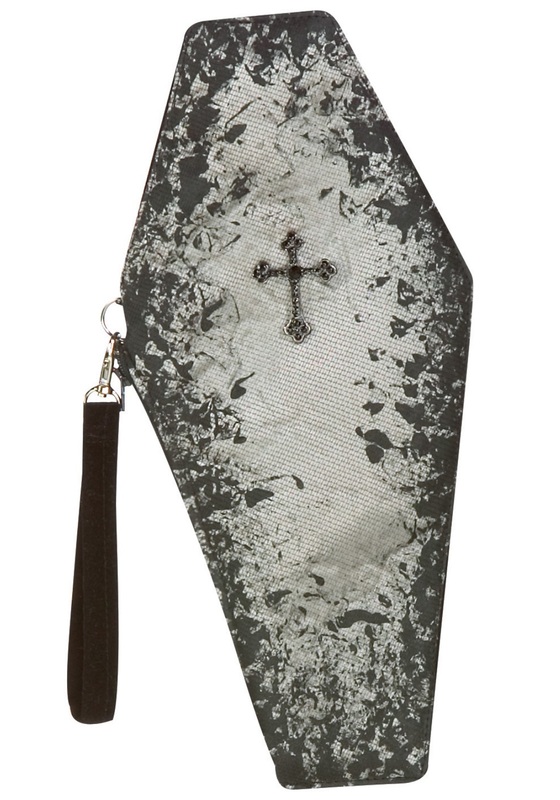 This novelty bag is a six sided coffin shape, it is adorned by a metal cross set with clear and black rhinestones on the front. The monochromatic themed bag will fit with any spooky Halloween costume. Add the perfect Coffin Handbag to accessorize your outfit.